In my time here as Director, I’ve been interviewed as an “expert” on Canadian foreign policy, the state of the Canadian media, the Quebec provincial election, the Government of Canada’s apology to the First Nations, current events in Canada, and, of course, the expansion of Tim Hortons into the US. Here’s my latest foray in the Vermont media. Someday, someone will ask me about Canadian literature, right? Seriously, though, I love what I do and am always happy to speak to media. The media people I have dealt with here always know a lot about Canada and aim to make their audience more aware of Canadian issues. Who can say no to helping out with that? 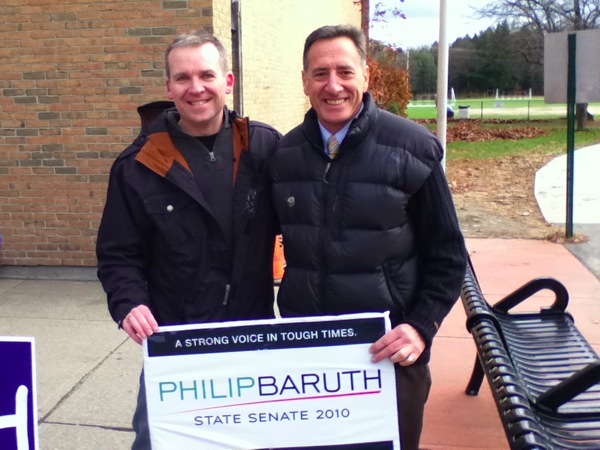 This photo is of Peter Shumlin and me on Election Day. He was nice enough to hold my Philip Baruth sign while I stepped away for a few minutes. Any Governor who has read Alistair MacLeod and knows him personally is a friend of mine and a friend of Canada’s.